Cindi took the long way from Queens NY to New Milford, first graduating from Northeastern University in Boston, then getting her Masters in PT from USC in California. Over the past 30 years she has taken extensive coursework in many areas of PT with an emphasis in orthopedics and manual therapy. 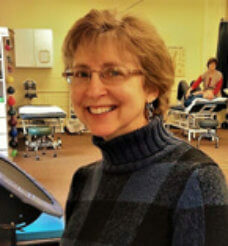 She holds certifications in Lymphedema and Integrative Manual Therapy. Cindi has a special interest in orthopedics, chronic pain and lymphedema. She has been an employee of Carlson since 2001.